A stellar lineup for 2018, the biggest lineup ever for TEDxXiguan. How to attend the TED conference without leaving Guangzhou? Go to TEDxXiguan! TEDxXiguan organized the TEDxXiguanLive event on 29th Apr, the Live on its tail means it’s a simulcast event, live-streaming from the TED Conference, where the most forward thinkers and doers of our time take the stage in turns and give the talk of their lives under 18 minutes. Yet not all of the TED talks will be published on TED.com, not to mention you will only be able to see them when the buzz is gently hushed. That’s why TEDxXiguan organizes this Live event, wishing to bring the ideas into our community in their most original form in a timely manner. 100 audience joined the party, we watched the talks and enjoyed snacks and wine. Discussion topics including gender equality; the future of Internet; how should we work and how should we set goals; the power behind China’s tech innovation and many more. The audience left feeling a healthy dose of critical thinking and open-mindedness. For more TEDxXiguan events please follow its official WeChat account: tedxxiguan and website www.tedxxiguan.com. Are you the next TEDxXiguan Speaker? Maybe you have only seen a few TEDxXiguan talk videos online, or you have attended all of our previous events in person. Maybe you just realized: wait a minute, I have a brilliant idea to share too! Or you want to recommend a speaker to us. In the year of 2018, we will continue to bring our flagship TEDx event to our community, and this time we are trying something new to give you the chance of becoming a speaker yourself. What kind of ideas are we looking for? Your idea doesn’t have to be about any certain topic or theme, but it has to be “worth sharing” - that is to say, your idea needs to be beneficial for the audience and bring positive impact to other people’s lives, instead of only making you or your company famous. Maybe your startup takes on a challenge we all face and deserve more attention; maybe you noticed something from an advantage point where no others have noticed yet; maybe some of your past experience has become the beacon of your life, and you are ready to share that with others; maybe you are doing some cutting-edge research, potentially could change the trajectory of the human species; maybe you want to share your unique art; maybe you have a performance that is so memorable… Join our idea search now! Think deeply what your talk is going to be about, and write down a one-minute preview. It can be the structure of your talk or the beginning of it. Video yourself giving this one-minute preview, with your phone or camera. Upload this film to a video site (Youku, Tencent, YouTube, Vimeo, etc.) and set your video name as [Your name] TEDxXiguan 2018 Idea Search: [The theme of your talk], for example, “John Smith TEDxXiguan 2018 Idea Search: How to create change”. You can save your video as private, or with a password. You can also submit your video via our application form. Finally, finish the application form at https://jinshuju.net/f/oMgzqX, remember to paste in the link to your video, then submit! If you are selected you will be given 5 minutes stage time during a TEDxXiguan Idea Search event in April to test your talk with us, the TEDxXiguan Conference of the year will take place end of August. The deadline for application is 12:00 PM on 15th April 2018. If you want to recommend someone else, you can share this post with them, or nominate them at TEDxXiguan Website. We look forward to hearing from you! Highlight pictures from TEDxXiguanED 2017 event. What you choose not to do in an event, is equally important to those ones you choose to do. On August 13th, the 2016 TEDxXiguan annual conference will be held, where 13 speakers will share their great ideas around the theme of “Constructive Disruption”. * Speaker line-up in no particular order. Jun Lu was honoured as one of the 100 creative and talented artists in Creative Genius: 100 Contemporary Artists. He won the Photography Gold medal, the Sculpture Bronze and the Digital art Silver Prize separately on the 7th, 9th and 10th X Biennale di Firenze, and also won as the outstanding photographer of Pingyao International photography, his works being on exhibitions in museums and galleries across the world. He is a pioneer in the development of “Digital Ink and Wash”. By capturing the moments that the colours taking changes in the water, he perfectly presents different scenarios while colours meet the water. Actually, this can be tracked back to the Chinese traditional wash paintings in the old time, but he renovates the storytelling style, and develops it into a more abstract and contemporary artistic expression. Martin Yan, the world’s foremost expert on Chinese cooking and the host of the famous cooking TV show, brings the ancient country’s beauty to the table with gorgeous dishes, breathtaking photographs, and fascinating information about the food, history, and culture of China. He is also the author of 6 cookbooks. Never one to rest on his laurels, Martin has remained an active international food ambassador. He roams the world respresenting different commercial and social concerns to entertain and educate the public, sharing with them his unique humor and strong passion for Chinese cooking. Zhiyong Xi is a professor at Sun Yat-sen University and Michigan State University. Xi has led a Guangzhou- based pilot field study using mosquitoes infected with Wolbachia bacteria, which aims at curbing on the reproduction of mosquitoes that carry dengue and Zika virus in order to prevent dengue and Zika diseases spreading around the world. Remarkable achievements have been made since the launch of this project. Xi hopes that, in the future, the way to reduce the number of mosquitoes that carry virus can be developed in controlling the number of roaches, flies and other pests. Metro started their career in 1998 singing aboard several ships with Celebrity Cruises. After four years with the fleet, they moved to Tokyo, Japan and performed for Tokyo Disney Sea in the American Waterfront. Their reputation for being exceptional entertainers caught the attention of the directors of Hong Kong Disneyland and in 2005, they were asked to open the park. After two years with the company, Metro made the decision to enter the mainstream music industry and they have never looked back. Since that time, Metro has discovered an entirely different variety of Cantonese and Mandarin music from the last 50 years and now performs some of China’s most beloved songs as well as their own compositions. After recording two trendsetting albums, in English, Cantonese and Mandarin, Metro has established themselves as powerful artists in the Asian music market. They recorded their first Cantonese music video, My Pride, in 2009 and the response was overwhelming. Shortly after, in 2010, Metro recorded Beyond’s famous rock ballad, Under A Vast Sky, making them a household name in Asian communities around the world. Metro currently makes their home in Hong Kong, China. Benjamin T. Wood works includes Shanghai's famous Xintiandi, Foshan’s Lingnantian and Hangzhou’s Xihutiandi, which perfectly incorporated local features. For years, Wood has been thinking about the way to reshape urban landscape, to provide a living place in rapid development still remaining its particular icon. Wilson is a Chartered Member of the UK Landscape Institute, a Professional Member of the Hong Kong Institute of Landscape Architects and the Hong Kong Institute of Urban Design. In 2012 he received award from the China International Urbanization Development Strategy Research Committee for his outstanding achievements. Wilson has designed, documented and administered a wide variety of architecture, landscape, urban planning and environmental projects, whilst specialising in sustainable design solutions with particular emphasis on socially inclusive design. He is devoted to bringing contemporary solutions to Clients. On August 13th, he is going to share with us how he designs with a forward-looking perspective and turns them into reality. Being designed humanoid, robots are dubbed as a kind of human in Chinese. There is never a lack of innovations and changes in technology. However, industrial designer Tommie Varekamp believes that we should pay more attention to user experience and human-machine interface by diversifying and individualizing robotics, rather than merely focus on technology. After all it is humans, instead of robots, who bring a whole new take toward the future. Linda TAN is the partner of Rice Harmony Cooperative, in charge of brand strategy, product development and farm and food education as well. She thinks and takes actions accordingly: how can we produce rice and vegetables in a more bio-friendly way? how should we guide ordinary people to a more sustainable pattern of production as well as consumption? Come and find the answer in person on August 13th! Chang works for the Hong Kong Dolphin Conservation Society. It has been 3 years since Taison started being involved in the research of Chinese white dolphins after graduating from the Hong Kong University of Science and Technology. He fights hard for the survival of dolphins with the local research team whose aim is to help the population of Chinese white dolphins and finless porpoises to thrive within Hong Kong water. Besides, they also give a lot of importance to captive animals, making joint efforts with local and international organizations to raise awareness in Hong Kong and Mainland China. Yahan Cao is a social designer from Taiwan and who now lives in Guangzhou. She is leading a project to design a better world for the elders. Instead of thinking that she knows everything, she asks for help and participation from the community itself as she facilitate changes to happen. Using design thinking to address social topics, she gave up her original identity, and blended herself into a new community and its cultural context. As she was experiencing unfamiliarity and change, she realized that design for the elders is actually design for us all. Our common belief is that photography highly relies on vision. However, Jing Li and her team are proving the opposite, through a photography project that is not visual. Their project has proven that visually-impaired people can also take incredible photos. 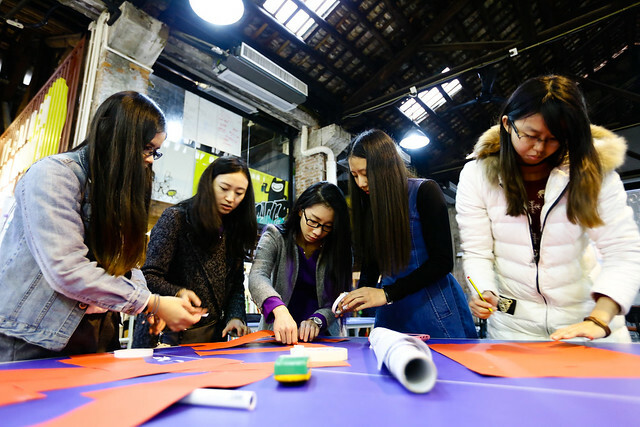 Drawing a conclusion is not the only goal, Jing Li and her team move forward by inviting people with regular vision to take part in this project in the hope of arousing public awareness of the daily problems that visually-impaired people encounter. She is a PhD candidate of urban and regional planning at the University of Hawaii at Manoa. As a professor of the State University of New York at Albany, she focuses on studying social development in an innovative way to enhance maintenance among societies. Additionally, she also maintains the collaboration between the Asian Development Bank and The United Nations Development Program. She focuses on new ways and means for reconstruction after a disaster. She believes minority in our common context can demonstrate adaptation and innovation when facing disaster. Teamacting is a consulting company, specialized in management and leadership. As the founder of Teamacting, Tristan believes that no matter how much we are used to the modern work style, there is still room for development. Tristan also provides suggestions and consulting to the European chamber and Roquette Corporate. When I was on my way to attend TEDSummit in the end of June, I got the news that Britain voted to leave the European Union. It stroke me hard not only because I never thought it would really happen, but also many other things, horrible things, started to seem possible. And the belief of mine that we all humans can work together, finding common ground more than disagreement might be totally wrong. A week of TED conference is like living in an utopia. Countless encounters, smiles, deep conversations. There was no border, no difference of colours of the skin, no “tags”. We were all the same, we were all there to listen, and learn from each other. TED’s curator Chris Anderson gave one talk, then he turned it into a blog piece posted on ideas.ted.com. I decided to translate it and share it with my community. It explains where we stand, and why we organise TEDx events. This piece was originally published on ideas.ted.com. This translation and publication of this translation have been authorised by TED. The original post could be found at here. Original post could be found at here. What _______ experience do you own besides working and studying? Have you ever considered how to create more possibilities for you and the community you belong to? TEDxXiguan is a TEDx event, devoted to spreading ideas and forging them into action. We pride ourselves with the most historical name in Guangzhou, representing the juncture between the new and the old, the change & the unchanged. The first TEDxXiguan event was organised in 2014 but some core team members have been part of the TEDx community since 2011. Our mission, is to stage ideas and explore possibilities that make positive changes in our community. In the past year, we held TEDxXiguanED, and pictured future education widely over and over. At the very beginning of this year, another event took place in an old building in Xiguan, which was TEDxXiguan Live, then we were endowed with chances to talk with the world. We are grateful for the support of everyone as always, and you, who may just start noticing us now. It's you who made every TEDxXiguan event possible and better. If you are the kind of people who are curious about our local community with fresh ideas springing out from your mind, congratulations you have found your camp! Now, let's see how our second life might match yours. Vitality stays in us permanently. Please believe people who embrace dreams and being ambitious always have young blood. Members of our team are from all walks of life, such as media, PR, advertisement, interpretation, freelance etc. Our arms are open to people who want to enjoy the life of slash. .
We are convinced that, it is nothing but difference that makes life splendid, and diversity that makes it dynamic. Eyes on global changes, minds on community progress. We are curious about anything and everythjing, and making effort to bring wonderful & enjoyable experience to as many people as we can. It takes wisdom to think and act accordingly. What we have been doing is to explore our individual potential and step out of our comfort zone. With this spirit, we march on. Thought-collision is such a pleasure. It inspires ideas ,even solve problems. It also keeps us curious about the world all the time, just like children. With TEDxXiguan, There Is No Limit. There is no limit on you we believe. Join us, make TEDxXiguan the HUB for great ideas. Let's embrace life harder, explore the world deeper, spread fantastic ideas even further. - Engaged in Team building. - From individual communication with any teammate to overall team development. - You are expected to be experienced in brand-promotion and enjoy wide connection among different industries. - Manage existing partnership resources, responsible for maintaining partner ship and develop more cooperative opportunities. - Splendid as the world is, it is you who are supposed to discover those marvelous and spread them. - Capable to turn usual translation into interesting, beneficial, and useful expression. - Work closely with the Curator to select and prepare speakers. - Responsible for all visual works. - Come and generate some visual creation. - For instance, create some new ways to record the world with us. How Slash your life could be? You can be more ( ) ? TEDxXiguan is a local yet at the same time international platform, celebrates great ideas and forging them into actions. This platform is built around TED’s ideal “Ideas Worth Spreading” and officially licensed TEDxXiguan conferences and activities. This year is a critical year in TEDxXiguan history. Not only because we have successfully finished the first TEDx ED (Education) event in mainland China in 2015, then a big TEDxLive party, everybody is watching what’s TEDxXiguan’s next move. We ourselves are also striving to deliver something new, something bigger, something bolder, with only improvement in quality in every single aspect we operate in. That doesn’t mean we are distracted by the idea of becoming “better”. In fact, we are investing unprecedented effort, into putting together the speaker line-up for this year. And that is where you can help us. We are a small group, as a matter of fact we can’t find all of the great ideas in Guangzhou, on ourselves, not to mention all of the great ideas in the world. That’s why we opened “Speaker Nomination Process”, if you know someone belongs to TEDxXiguan Stage, or you think yourself belong there, nominate him/her from the menu on our WeChat account, or on our website. Another way of being part of our mission, is to become a partner. As an non-profit organisation all of our income are 100% put into the production and maintenance cost of our event. Nobody working with TEDxXiguan, not even the speakers, are being paid. So partnership is really our lifeblood. We don’t call it “Sponsorship”, because marketing with TEDxXiguan is not only giving your marketing budget out for a logo appearance opportunity. For every single one of our partners we customise our package for their best experience. We offer design consultancy from our own organising committee and our Braintrust, a group of people working in media, advertising, marketing, internet, law, etc., to ensure our partners create meaningful interaction with their target audience. Partnership with us is not only an one-off activity, some of our partners get to “travel the world” with our talk videos. For your customised partnership plan, please contact us at partnerships@tedxxiguan.com, or simply drop us a message in WeChat, one of our team will reach out to you. Our TEDxXiguan events are made possible by our great partners, and we invite you to think with us, how you can be part with us. Be you a creative agency who could help us on our design and marketing strategy, a staging company could help us to do audio & visual set up, a F&B business want to showcase your latest recipe. Let’s create something great for our community that we are all proud of it. There were some great companies joined our mission last year, I encourage you to check them out on our website. If you neither know anyone to nominate, nor control your company’s marketing budget - no problem at all, help us by sharing this message, and become a TEDxXiguan Ambassador, the reason why you are reading this, we believe, is because you believe in the power of great ideas, just like us. Last night in a space where old historical building meet modern creative minds, TEDxXiguanLive concluded with some great conversations. We streamed live from TED2016 in Vancouver, and we chose Session 8: Nightmare? as our content. This session started by Al Gore, former U.S. vice president and Nobel Prize laureate. In his 4th TED Stage appearance, he passionately pointed out for the climate crisis we are facing, we need to change, we can change, and we will change. In one of his slides, our beloved city Guangzhou is featured as one of top 10 cities at risk from sea level rise in 2070 by assets at risk. Now with CRISPR, gene editing seems to become a tool at anyone’s reach. According to Jennifer Kahn a talented high-schooler can do it, where can this technology lead us, and what are the potential dangers? We then heard the beautiful singing from Rhiannon Giddens, her voice bring history to life through music. Because of video stream became not as smooth at this point, we moved into planned conversation. There are some great conversations and some audience even felt the conversation part was the most enlightening session. We discussed climate change, some weird imagination of gene editing, and what we can do to stop extreme poverty. There will be more TEDxXiguan events down the line for year 2016, as we have announced our theme - Constructive Disruption - share with us what’s your take and what do you expect. If you have taken some nice pictures, please share them and tag #TEDxXiguan#. Have you ever dreamed of attending TED Conference? Yes I am talking about THAT TED conference Bill Gates, Al Gore, Jane Goodall and many more great minds have spoken at. Here is a little peak into the ‘taste’ of TED Conference. But attending TED Conference can be very expensive. You normally need to travel to Vancouver, or Long Beach, not to mention the entry ticket is around 8,000 US dollars. Even if you decided to buy a license to watch it from home, it will cost you 100 US dollars. And, who wants to watch these great talks ALONE without like-minded friends to talk with and have some fun in the same time? So we, TEDxXiguan, decided to bring the TED experience closer to you in Guangzhou, free of charge. Imagine a home party, a full house of people just like you, who pay extra attention to our society, the planet (and many other planets! ), who cares, striking to make some difference, with food & drinks. And of course, watching the TED Conference LIVE STREAMING together - can anyone name anything better? We expect you to be curious, open-minded, respectful and tolerant. Does that sound just like you? We think so! Your great ideas to share with others, and a small amount of cash to cover some food & drinks. All purchase will be made directly to the venue or our vendors, TEDxXiguan will not be handling any money or have any income. On the night of Feb 19 (nothing better than doing this for the first Friday night after CNY), save the date and stay tuned, application will be opened soon and venue to be announced too. More contents are coming, stay tuned.